Often referred to as the CT Mixer the Komax Custody Transfer Mixer is installed upstream of the crude oil sampling transfer line. It is designed to assure that the bottom sediment and water – B, S & W – is thoroughly dispersed throughout the crude oil stream for optimal crude oil metering performance. An even water droplet size and distribution occurs over a wide flow range and pipe size range. Our automation means a truly representative and repeatable oil sampling process. Komax Custody Transfer mixers are installed in petroleum custody transfer sampling lines such as ship and tank truck terminals or refinery transfers in combination with a LACT unit where proper crude oil metering is an absolute must. 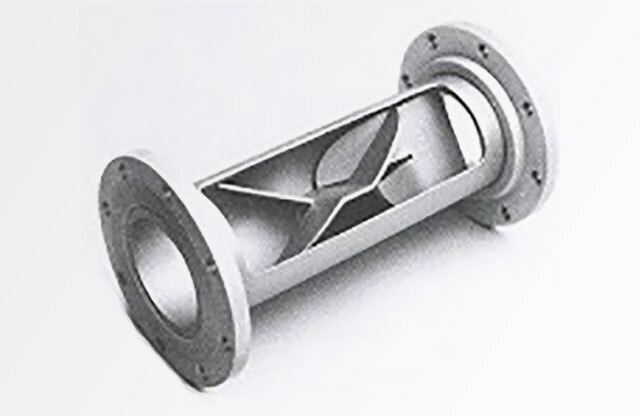 The CT mixers are usually supplied with weld neck flanges or ends ready for welding. 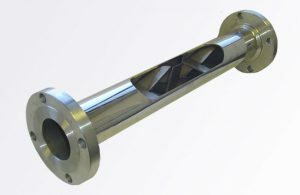 Komax CT mixers are supplied complete with a two-inch flanged port for the automatic sampler connection, for ease of installation. The Komax CT mixer was specially designed to solve conventional custody transfer sampling and mixing problems. The CT mixer may be installed in a horizontal or vertical pipeline. 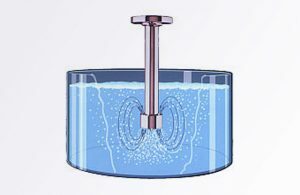 In a horizontal line, the first mixing element is set 30 degrees off the centerline so the bottom mixing element ear acts as a ramp, forcing the bottom water up into the crude (see Figures 1 and 2). The internal vortices or back-mixing created by the Komax mixing elements also send a portion of the flow back upstream within the mixer, minimizing spikes of BS&W concentration. This combination of smart mixing helps the custody transfer sampler maximize its accuracy. Komax uniquely understands site-specific smart mixing, avoiding overmixing or emulsifying, and produces a very uniform distribution and droplet size of the water in the custody transfer metering process. 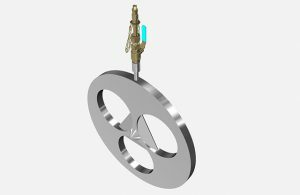 A very important feature of the Komax CT mixer is the addition of a special exit straightening fin that cancels all of the axial rotation of the flow downstream of the mixer. Violent rotation of the stream would cause the centrifuging problem (barber poling) of the water to re-occur. The automatic sampler is located two to four pipe diameters downstream of the mixer. The resulting samples provide highly reliable net crude oil measurements. Over twenty five years ago, the Chief Engineer of Chevron Pipeline Company in Concord, California approached KOMAX Systems seeking assistance in development of a low pressure drop static mixer designed specifically to optimize accuracy of crude oil sampling. After months of intensive product development and laboratory testing, KOMAX engineers derived the Custody Transfer (CT) mixer design as a recommended solution to Chevron Pipeline mixing application. To observe the mixing performance of various static mixer designs, clear mineral oil was pumped through transparent glass piping system prototypes to simulate crude oil. Dyed water was injected into this mineral oil process stream to simulate BS & W (bottom sediment and water). Over sixty petroleum engineers from several major oil companies visited KOMAX to witness this testing since errors in crude oil sampling were an industry-wide problem plaguing profitability. The Komax CT mixer in action illustrates the extraordinary results these engineers witnessed. It is clear to see the fully homogeneous dispersion of the dyed water into the clear mineral oil immediately downstream of the mixer, even at low fluid velocities. Over 10,000 Komax custody transfer sampling mixers have since been installed worldwide and this remarkably efficient device is now considered the industry standard for custody transfer applications. As a result of the spectacular results obtained mixing BS & W into crude oil process streams prior to sampling, KOMAX Custody Transfer mixers have been proven to pay for themselves in as little as six hours. Off Loading Time: Under 24 hours. Over 10,000 Komax CT mixers have been installed worldwide. Typical BS&W detected is an additional 1.0% and higher over other inline mixing methods such as the standard vertical pipe loop used for mixing.